Not to bum you out or anything, but you are going to die. One day, whenever, it will happen because unless you’re Tuck Everlasting or Vanna White, the only certainty you can bank on in this wild and wonderful world is the simple fact that death is universal. It’s somewhat natural to know our own mortality, but accepting this when it happens to someone you love is a different story entirely. It’s not fair that our friends and family and heck, pets can just not be there one day, and the act of eventually coming to accept this is easily one of the most difficult and trying experiences most of us will ever have. They Came Back is a French arthouse horror film of sorts from 2008 and one that, among other things, asks what happens when mourning is annulled. It can tentatively be classified in the zombie genre simply because its basic premise hinges on the dead returning to life, but much like the similarly not-zombie-zombie film Deadgirl, it’s far more focused on exploring certain aspects of man and his world than giving us gore. Quick Plot: On a sunny summer day in the suburbs of Paris, 70 million men and women who passed away in the last ten years or so wander back into town. They’re not hungry for brains or decomposing en route; they’re just there, all a little bit off and quiet, a look of distance in their eyes. They certainly seem disconnected with those around them but also, healthy and...you know...alive. 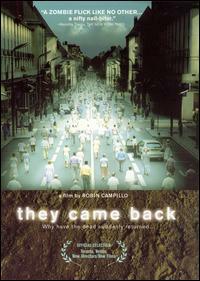 They Came Back is an ensemble story, though it does extract a few main characters from its city council. There’s the elderly mayor widower who now has to balance reorganizing pensions with reconnecting with his previously deceased wife. A couple welcomes back their young son, a boy whose sudden lack of social skills spell a whole different future for his family. The father’s possible former lover, Rachel (it’s hinted at rather subtly), is initially hesitant to even see her late partner, though slowly, she finds herself falling back in love with him or whatever it is that he has become. Along the way, we watch the city officials organize public shelters and hold conferences on what exactly millions of returned healthy corpses means for the budget. It’s not easy to discuss They Came Back, in part because it defies any easy categorization. Dubbing it horror is dangerous, since it can easily affect your anticipation as you wonder where this eerie atmosphere and setup will lead. I was unsettled throughout the film, much in that same pseudo-horror manner left by the unique and powerful Lake Mungo. Where that film brilliantly focused so closely on a single family’s grieving process, They Came Back lightly tiptoes on a range of issues that surround the broader issue of death. It doesn’t force bureaucracy on us, but there are some effective town hall meetings and multi-sided discussions wherein we see the cold and detached treatment of a new race of people in an already crowded world. There are no easy answers, but They Came Back poses plenty of fascinating questions. There’s a lot about They Came Back that made me think of Jose Saramago’s brilliant novel (and not so brilliant film) Blindness. Both capture a seemingly isolated society plagued with a bizarre spell of sorts (in Blindness, the entire population loses their eyesight) and have a certain cold humanism about their approaches to following a large society dealing with a disaster. I guess what I’m saying is that if you like Blindness, check out They Came Back, and no matter who you are, read Blindness. I definitely endorse a rental of They Came Back, although I make no promises that you will not find it snail-paced or teasing. Or maybe it will touch you in a haunting manner you find fresh and new. Jah no say pa. Either way, it’s an unusual film that certainly warrants a chance from the curious-minded cinemaniac looking for something genuinely different. Thanks for this, sounds just like my kind of film. I can't believe I haven't heard of it before. I only heard about it a few months ago from Fangoria's 300th issue. I'd love to hear your thoughts once you see it, as it's easily one of those films that's more entertaining to think and talk about than to necessarily watch. Hope you do a review! I saw this about two years ago I think, so I don't remember TOO much about it other than being somewhat amused by the film's theme and that it featured a bunch of senior citizens coming back from the grave. I guess not having any desire to revisit it since then means I didn't like it as much as you obviously do, but I appreciate it for all the reasons you mention. Definitely a noteworthy "unconventional zombie" movie. It doesn't flesh out its theme in a huge way, so I can see you kind of forgetting about it. And it's definitely a slow mover, but it just worked for me on a weirdly emotional emotionless level. Hm. Sounds more like a drama than horror. And dare I say, I like the non-explanation vibe of it. It really isn't so much a horror film. There's some truly haunting stuff going on, but the film is ultimately never trying to actually scare you. It's part political metaphor, part ghost story, part relationship drama...lots o' things and definitely unique. I'd love to hear your thoughts on it Ashlee! Oh I'm sure it's also targeting the politics of immigration, without question. Using 'the dead' works so well because it could really stand for a lot of 'minority' groups, be it immigrants, the elderly, those with mental illness, etc. It's fascinating that the film can ask SO many questions both on a political and deeply human level. I realize now this is one of those movies that gets SO much more interesting after the fact when you have room to think and talk about it. I really hope you do watch it soon! I watched this about 3 years ago and really didn't know what to make of it. I went into it thinking it was some offbeat zombie movie and obviously I had the wrong expectations while watching it. I think it's a film that I should revisit from a different viewpoint. I do remember it being very slow but I can handle that. My girlfriend liked it so much that she wrote an essay about it for one of her college courses. It's SUCH a perfect film to write a paper on! I'd encourage a rewatch. Now that you know what type of film you're getting into, I think you might find something really neat there. Have you ever read Saramago's "Death, with Interruptions?" It's even closer to the idea of this movie. 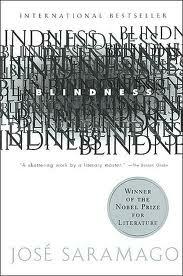 It's like "Blindness," only, instead of an unexplained mass affliction of blindness, people mysteriously stop dying. Funny, I requested that book from the library and then missed my chance to pick it up! I DID read SEEING, Saramago's followup to BLINDNESS, which was a little dryer and not quite as gripping but still quite good. I'll definitely put DEATH, WITH INTERRUPTIONS on my Amazon list for the next time I need to pad out an order for free shipping. (This has become the way I get books these days.) Sounds pretty fascinating.